Not because it represents sound logic or pragmatic rationale. Because it reflects how I feel. If you tinker like me, you've had projects come up in which that one little thing just wouldn't budge. 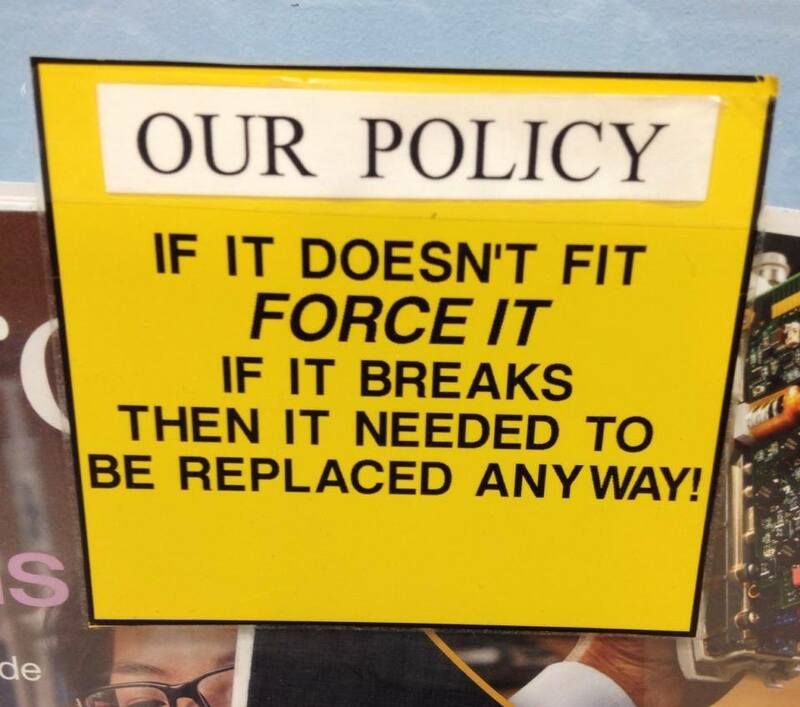 Maybe it's a bolt that won't loosen, a screw that's stripped, or a fitting that just won't fit (how ironic, right?). Whatever it is, it's stopping progress. It stands between you and all that happiness that awaits you at the end of a finished project. You want so badly to be happy, but now you're stuck with frustration. Every impulse in your body wants to smash what you're working on (or maybe that's just me). The item that stands between you and success becomes your mortal enemy, and you would love nothing more than to jam it where it needs to be at the expense of its life. And that's how signs like this get posted. This is funny. I smiled. Then I started thinking. How often in life do we try to force things? How often have I tried to make something happen that wasn't meant to be (whatever that means) or was ill-timed. I'm all for go-getters and people that make things happen. They're good people, but they can be tempted to make things happen now that should have been waited on; or to make things happen that just don't fit. Maybe it's a career choice. Maybe it's building a boat in your basement. Going back to the sign, sometimes you need to walk away from that project and let your nerves settle. Walk away and quit trying so hard. Your trying can give you tunnel vision that blinds you from the big picture. Step back. Then come back later to conquer. Or you may end up forcing it where it doesn't need to be. I've done that many times--never happy with the result. Oh yeah, I needed to hear (read) this one!